Corvette has followed its own formula as an American original since 1953. Corvette�s bandwidth expands even further with the return of the Corvette ZR1. Powered by a supercharged 638-hp LS9 V8, it has a test-track top speed of 205 mph � a stunning, new performance benchmark for a GM production car. 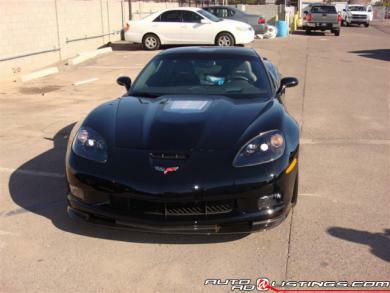 The ZR1 (very limited availability) is powered by a 6.2 Liter aluminum-block V8 boosted by an Eaton� TVS� (Twin Vortices Series) supercharger for a total power output of 638 hp at 6500 rpm and 604 lb.-ft. of torque at 3800 rpm. It is the most powerful motor ever to occupy the engine bay of a General Motors production car. The supercharger features four lobes instead of the usual three for higher power and efficiency. It also features an intercooler to cool down the air/fuel charge for more power. In addition, nozzles squirt cooling oil into the underside of each piston. The engine also features a dual-pressure fuel injection system for peak performance during multiple operating conditions. Like the LS7 engine in the Z06, the LS9 features titanium connecting rods and exhaust valves as well as a dry-sump oil system with a larger capacity reservoir − now 10.5 quarts. The LS9 is hand-assembled at the GM Performance Build Center in Wixom, Mich.